Colorado Nepal Alliance (CNA) has returned from a site visit to Darkha, a village in the Dhading District of Nepal. They were accompanied by Ajay Magar, an architect with Nepal-based Landmark Architectural Design Studio, and Sailendra Shrestha, a local building contractor. The primary purpose of the visit was to assess the damage at the Shree Ganesh Kunda Higher Secondary School, a school in Darkha that CNA has committed to help rebuild. The earthquakes in April and May of 2015 destroyed nearly all of the buildings on the school’s campus. The lone exception was a newly-built reinforced concrete building, providing two offices and two classrooms to share among its six-hundred students and staff. Today, nearly all students are studying in temporary open-air shelters. There is some interest in building a second reinforced concrete building. But procuring and transporting the materials for such a building would be extremely expensive, and skilled labor would have to be brought-in from a city for its construction. CNA and its partners have proposed a single-story structure utilizing earthquake resistant technology that can be built by local builders and labor. 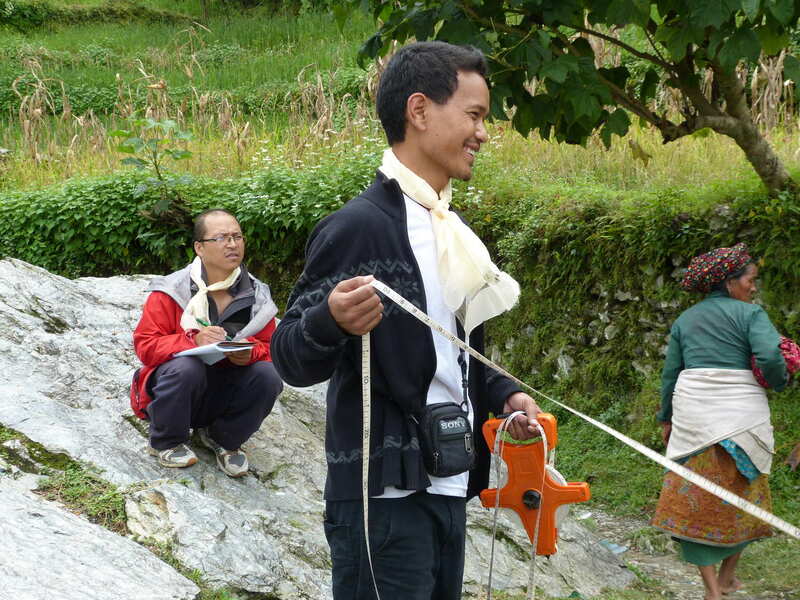 By training local builders to use earthquake resistant building techniques, CNA hopes to make a regional impact as knowledge is shared from community to community. A focus on using locally available and appropriate building materials is critical in a place where the high cost of reinforced concrete puts it out of reach for the majority of residents. Along with their Nepali architectural firm, CNA is in the process of assessing what technologies are most appropriate for the site. Soil samples are being analyzed to indicate if earthbag building techniques are site-appropriate. The availability of timber, the quality of stones, and the composition of the local mud, (for use as mortar in traditional structures), are also being assessed. CNA expects to announce preliminary designs sometime in October. CNA also conducted a visit to the site of a classroom they were building at a primary school in Kuri last winter, until their work was halted by the spring 2015 earthquakes. In the quakes, Kuri’s school buildings were totally destroyed. Students are presently studying in temporary structures. The school campus in Kuri is being considered as the future site of a four room primary school building, and CNA has begun fundraising to help with classroom rebuilding. Donors Kristin Logefero and Peter Glicklitch were founding donors for this project. The Kuri School Committee was heroically able to reconstruct some of the Kuri classroom (blue roof in photo) after the earthquakes. 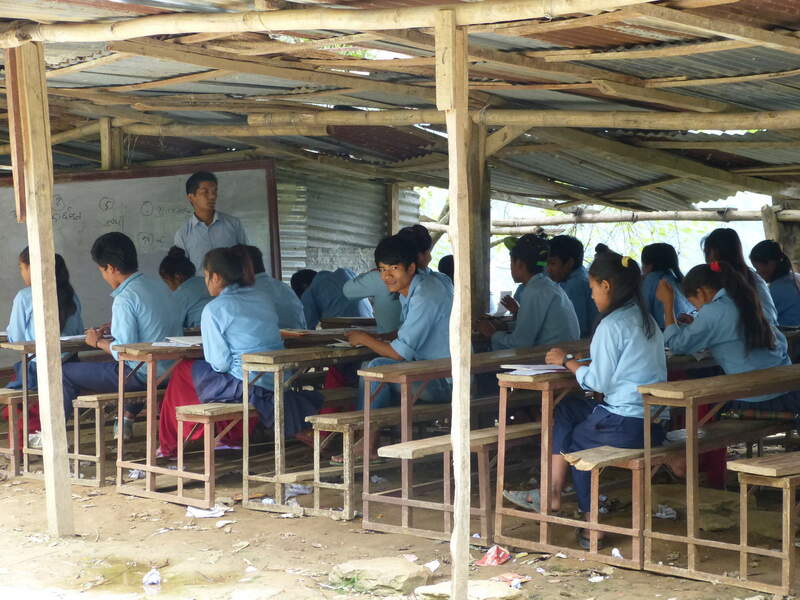 CNA had nearly completed work on the classroom when the April 2015 earthquake struck. The reconstructed walls have been kept low since there is no mortar on the higher parts that fell. Additional timbers were subsequently installed to support the roof and reinforce the walls. Landmark ADS architect Ajay Magar inspected the classroom and believes it is sturdy enough to withstand future seismic activity. 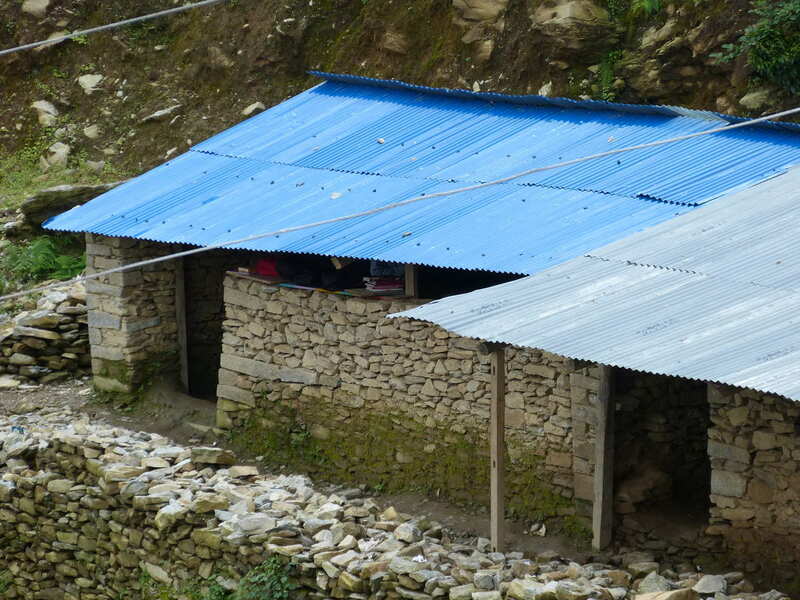 However winter is coming, and the open-roof, improvised classroom is ill-suited to the cold. We are specifically seeking donations to build more primary school rooms. We can’t do this without your help! Please visit ColoradoNepalAlliance.org/SchoolFund.